Comets terrified Henry V111 and the Elizabethans. But we think they're cool (as long as they miss the Pale Blue Dot). Some astronomers are increasingly thinking comets delivered Earth's original supply of organics. 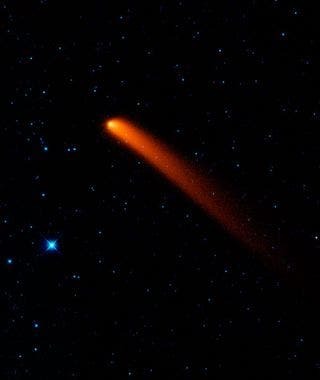 Comet “Siding Spring” appears to streak across the sky superman heading back to Krypton in this new infrared image from NASA's Wide-field Infrared Survey Explorer, or WISE. WISE will be looking for comets and asteroids that might pose a threat to Earth. The comet was discovered by Donna Burton in 2007 at Siding Spring Observatory in New South Wales, Australia. It was visible with binoculars until January 2010. It is widely believed among planetary scientists that carbon dioxide, not ammonia and methane, dominated Earth's earliest atmosphere. The primal, early conditions, essentially Earth as a molten ball with an atmosphere of carbon dioxide, nitrogen, and other volcanic emissions may not have favored widespread synthesis of organic molecules. The fact that life appeared soon after the termination of the heavy bombardment about 3.8 billion years ago suggests that it seems more reasonable that the incoming comets and asteroids delivered the compounds essential for life. The 2005 Deep Impact mission to Comet Tempel 1 discovered a mixture of organic and clay particles inside the comet that show it is overwhelmingly likely that life began in space, according to a new paper by Cardiff University scientists, professor Chandra Wickramasinghe and colleagues at the University’s Center for Astrobiology. One theory for the origins of life proposes that clay particles acted as a catalyst, converting simple organic molecules into more complex structures. The 2004 Stardust Mission to Comet Wild 2 found a range of complex hydrocarbon molecules – potential building blocks for life. The Cardiff team proposed the controversial theory that radioactive elements can keep water in liquid form in comet interiors for millions of years, making them potentially ideal “incubators” for early life. They also point out that the billions of comets in our solar system and across the galaxy contain far more clay than the early Earth did. The researchers calculate the odds of life starting on Earth rather than inside a comet at one trillion trillion (10 to the power of 24) to one against. In his brilliant essay, Extraterrestrials: A Modern View, University of Washington professor Guillermo Gonzalez wrote: "The kind of origin of life theory a scientist holds seems to depend on his/her field of specialty: oceanographers like to think it began in a deep sea thermal vent, biochemists like Stanley Miller prefer a warm tidal pool on the Earth's surface, astronomers insist that comets played an essential role by delivering complex molecules, and scientists who write science fiction part time imagine that the Earth was "seeded" by interstellar microbes."